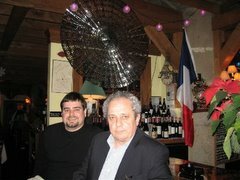 The "dean" of the French New Wave died last month. His work, over a period of 50 years, is arguably one of the most important in the post WWII history of French films. But personally, I do not think that 50 years from now his legacy as a film maker will leave a mark in film history as indelible as Godard’s, Rivette’s, Truffaut’s or Resnais. I’m talking about the determinant role that they played within the French New Wave movement in changing the way films are written, produced, and made. But nevertheless Rohmer had a major avant-garde part, as a writer and critic, in establishing some of the principles that lead to the launching of ‘’ La Nouvelle Vague’’ in the late Fifties. It is strange but when I learned a month ago in the French press about the passing of Eric Rohmer, an image jumped immediately out of my memory: the very expressive face of an American actor, Jess Hahn, who was the star of his first full-length feature film: ‘’Le Signe du Lion’’ (Sign of Leo). Hahn, who never had a significant career outside of France, played beautifully, in a fine blend of humor and sensibility, the role of a Dutch musician expatriate in Paris who wrongly believes he is about to inherit a lot of money from a distant aunt. But he gets completely broke and homeless when, after spending all the money he has celebrating with his friends, they leave him alone and destitute in the middle of August after he learns that he will get nothing. That marvelous and very atmospheric picture, shot in black and white in the street of Paris in 1958-1959, did not get a commercial, and very limited, distribution until 1962. It was panned by most of the mainstream critics at the time, and I had to wait until I moved to Paris in the summer of 1963 to be able to see it at the Cinémathèque. I know that a couple of DVD versions of this film exist in both France and the UK but I never found one in the U.S. It makes me sad because I would like very much to see it again. But this film has been haunting me since 1963 and it is one of the most significant movies of the “Nouvelle Vague” of the French Cinema. I’ll explain later what that “new wave” was all about. But before that film he had made several shorts, that I did not see, from 1950 (Journal d’un Scélérat) to 1956 (La Sonate à Kreutzer), including Charlotte ET son Steak in 1951, and Bérénice in 1954. So, from a strictly historical point of view, Rohmer can be considered as the ‘’dean’’ of the Nouvelle Vague du Cinéma Français if we consider that this movement started, as many film historians think, in 1956. 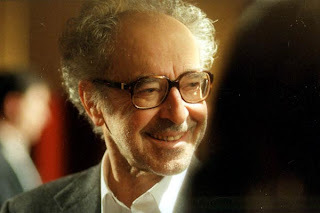 I’ve seen 24 of the 31 films that he made as a director between the early 50’’ and 2007, when he directed his last picture, ‘’Les Amours d’Astrée et de Céladon’’ (The Romance of Astrea and Celadon). That last film is very strange elegiac fantasy shot in beautiful natural settings in vivid colors. But it looks and sounds too much like a pure exercise in style and is marred by its two young unknown actors, in 17th century costumes, who recite their lines in such a contrived and artificial tone of voice that I had to fight to keep my interest alive and sometimes to stay awake. 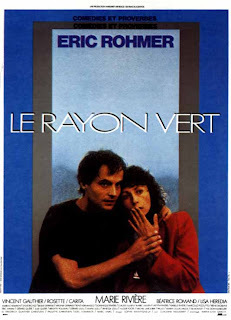 Le Rayon Vert (The Green Ray, or ‘’Summer’’ 1986), which is perhaps my favorite Rohmer film. A quite intriguing story of unplanned strange vacation, love and the slightly supernatural, taking place in the beautiful Biarritz area. Marie Rivière, one of Rohmer favorite actresses, is lovely. The film was awarded the Golden Lion at the Venice film fest. L’Anglaise et le Duc (The Lady and the Duke, 2001). A very impressive period film set during the Terror, a sad episode of the 1789 French Revolution, where Rohmer digitally reconstitutes the Paris of that time. Very solid script, good story, great acting and spectacular computer-generated imagery. Conte d’Automne (Autumn Tale 1998) a very attractive and touching story of adult love and friendships, and games of seduction set up in the beautiful natural settings of Languedoc wine country. The main actor, Alain Libolt, that I knew in the late 60’s, when I worked briefly in the fascinating field of cinema, is quite captivating. Le Genou de Claire (Claire’s Knee, 1970) is another elegant illustration of some of Rohmer’s obsessions with very young ladies disturbing the mental equilibrium of older men. Jean-Claude Brialy is very good and the cinematography, by the great Nestor Almendros, of the shores of Lac du Bourget is superb. Les Nuits de la Pleine Lune (Full Moon in Paris, 1983) once again involves a very young and independent woman (the lively and gifted actress Pascale Ogier who sadly died of a heart attack after the film). It describes her jumpy relationship with her boyfriend and other men, among them a writer played by the great Fabrice Lucchini whose career was launched by this film. Le Beau Mariage ( 1982) that introduces another of Rohmer’s favorite young actresses, Béatrice Romand who also plays in Le Genou de Claire and Conte d’Automne, as a young university student who decides suddenly to get married. But she needs a husband. She tries to convince a lawyer (played by one of Alain Resnais’s favorite actors, André Dussolier) to be that man. Arielle Dombasle and Pascal Greggory, two other well-known actors nowadays whose careers were greatly enhanced by this film, complete the cast. Ma Nuit Chez Maud ( My night at Maud’s 1969) a typical post-Nouvelle Vague film where a man is very attracted to a young woman but is very reluctant to seduce her and find himself spending the night at another woman’s apartment. There are a lot of intellectual conversations going on between the main characters but little action. Nevertheless the long nightly dialog that never switches to a real love duo between the very good Jean-Louis Trintignant and the very impressive Françoise Fabian is now a classic period piece. Once again very beautiful cinematography by Nestor Almendros. Some others were quite successful in Europe and in “art houses” all over the world, but frankly, they did not excite me that much. They were too “talkative” in the same typical boring “bourgeois” settings that were too often the typical environments of French post-new wave films in the late sixties, seventies, and way until the early eighties. Or perhaps the way actors said their sometimes very conventional lines got on my nerve. Or, because I often found Rohmer’s style of mise-en scene (directing) lacking both dynamism and precision. Even though I will never dispute the idea that Eric Rohmer occupied an important place in the history of the French cinema during the last 4 decades of the 20th century, he did not have the same impact in my book than Jean-Luc Godard, Jacques Rivette, Alain Resnais, Maurice Pialat, Francois Truffaut, Agnès Varda, Jacques Demy, or even Jean-Pierre Melville. I just rented two of his early “moyen-métrages’’ (medium-length films) that he shot just after the Signe du Lion in 62 and 63, La Boulangère de Monceau and La Carrière de Suzanne. They are focusing as it is too often the case in Rohmer’s films on some young men in Paris talking about what might be the best strategy to seduce young women or wondering if they are really interested in them and reciprocally. I have to admit that I found these two movies quite dated, boring, poorly acted, not even really interesting as far as directing and editing are concerned. But they are very revealing of the way young people from the ‘’bourgeoisie parisienne’’ behaved in those days. And the shooting techniques used reminded me sometimes of those of the earlier ‘’moyen-métrages’’ of Truffaut, Godard, and Rivette such as Les Mistons, Le Coup du Berger, Histoire d’Eau, or Tous les Garçons s’appellent Patrick. But they surely do not have the same punch, sense of humor and natural gift for innovative directing. The next cycle was called Contes des Quatre Saisons (Tales of the Four Seasons) and its 4 movies, one for each season, were produced between 1989 and 1998. La Marquise d’O (1976) a really beautifully shot period piece adapted from Kleist, and Perceval le Gallois (1978) that confirmed the talent of actor Fabrice Luchini and: Triple Agent (2004) a relatively captivating and nicely directed spy mystery. In spite of a very imprecise script, I sort of liked that movie. He was perhaps the most private, even secretive, person the French movie industry has ever known. We do not know much about his parents. And for the first 3 days after his passing many people were scrambling to find out if he was born Maurice Henri Joseph Scherer, born in Tulle (in the department of Corrèze) on March 20 1920, or Jean-Marie Maurice Scherer, born in Nancy, in Lorraine, on April 4th 1920. Journalists knew that he had a famous brother who is a philosopher, a wife and two sons, but their names are not known. What we know for sure is that he was not planning in his youth to become a film maker, but wanted to be a novelist. In fact he published a novel in the late 40’s ‘’Elizabeth’’, under another name, Gilbert Cordier. He then taught French literature in a high-school. But it is after he attended the Biarritz Film Festival in 1949 and when he moved to Paris for good in 1950, that he became an even more avid moviegoer and decided to write full-time about cinema. 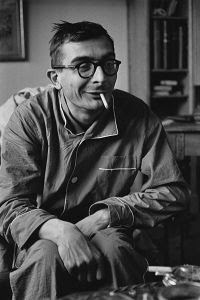 At that time he had completed his film education by attending numerous screenings at the famous CINE CLUB DU QUARTIER LATIN (Film Club of the Latin Quarter) where he established solid bonds with 4 cinephiles Claude Chabrol, Jean-Luc Godard, Jacques Rivette, and later on François Truffaut, who were all dreaming of shooting a picture. Godard and Chabrol (born in 1930) were 10 years younger than Rohmer. Rivette was 8 years younger. And Truffaut was 12 years younger but from the mid to the late fifties had acquired quite a reputations with his vitriolic articles criticizing the very traditional French cinema of the post WWII era in magazines such as ARTS and La REVUE du CINEMA. Rohmer became editor of the newsletter of that Ciné-club. In May of 1950, along with Jean-Luc Godard, and Jacques Rivette, Rohmer, transformed it in a magazine called La Gazette Du Cinema. Besides those 3 critics it also attracted prestigious contributors such as Jean-Paul Sartre, Alexandre Astruc, and later Claude Chabrol. But the magazine published only 5 issues and disappeared in November of that same year. However, prior to that experience with la Gazette, Rivette and Rohmer had been writing a few articles for a serious magazine about films, La Revue Du Cinéma that had been founded in 1928 by Jean-Georges Auriol. The publication of that very important magazine was stopped in 1931, then started again in 1946 with the help of Jacques Doniol-Valcroze and Pierre Kast who in the late 50’s and very early 60’s made, as directors, some very entertaining films such as L’Eau à La Bouche and Le Bel Age. Bazin wrote his first important articles about the notion of ‘’auteur de films’’ in that magazine. And in June 1948 Rohmer signed his first important article on the theme of ‘’Cinéma, the art of space’’. La Revue du Cinéma went dead again in 1949. Ciné-clubs, Objectif 49, and La Cinémathèque, the 3 melting pots of serious young film buffs in search of a new approach to cinéma. Ciné-clubs, that appeared in the 30's in Paris and several l French towns, became increasingly popular during the tough times of the German occupation, and their expansion literally tripled between 1945 and 1955. At that time, a very important film club, OBJECTIF 49, was created by André Bazin, Alexandre Astruc, Piere Kast, Jacques-Doniol Valcroze. It had the blessing of important directors such as Bresson, Grémillon, Cocteau and Roger Leenhardt, whose marvelous ‘’Les dernières Vacances’’ was perhaps the early precursor of La Nouvelle Vague, along with ‘’ Le Silence de la Mer’’ by Jean-Piere Melville. Both films were made in 1947. The purpose of Objective 49 was to change the critical perception of marginal or little-known films and directors. Its most publicized event was the organization of the Festival Du Film Maudit ( Festival of Cursed Films) in Biarritz,a very lovely town on the Atlantic Ocean near the Spanish border, in June of 1949. That event brought together for the first time the young critics and future directors of the Nouvelle Vague, like Godard, Chabrol, Rivette, and the even younger François Truffaut, and the older guys like Bazin, Doniol-Valcroze, Leenhardt, Kast, and Eric Rohmer. 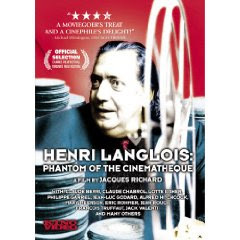 Back to Paris, all these people started to meet each other regularly over the next few years and discuss film projects at the CINEMATHEQUE, Rue de Messine, and later Rue d’Ulm, under the magical guidance of Henri Langlois. The Nouvelle Vague was about to emerge in the late 50’s from all these screenings, meetings, and articles. In 1951, a group of serious film writers and critics coming from various newspapers, as well as La Revue du Cinema, were regrouped in a new magazine by André Bazin, Lo Duca, and Jacques Doniol-Valcroze. It was called LES CAHIERS DU CINEMA. The cover of the first issue published in April of 1951 was entirely devoted to a photo of Gloria Swanson in Sunset Boulevard of Billy Wilder. It was in itself a very clear clue of what the editorial policy of that new French magazine was going to be. In 2010, it is still published under this title even though all the original editors and contributors have been gone for years, or do not write anymore. It had several owners since 1951, the last one being the daily newspaper Le Monde, which sold it recently to a British publisher. But the editorial staff is still located in Paris. The magazine editorial policy has been fluctuating many times and the successive editorial teams, over the years, reflected very different political and editorial trends. It gave Les Cahiers all kinds of flavors, from Maoist, to almost conservative. Nowadays the magazine is still a monthly and looks and tastes a bit like a mix of its mid-sixties and mid-eighties formats. It offers an on-line edition. In the early 50’s ROHMER joined other critics like Rivette, Godard and Chabrol at Les Cahiers du Cinéma, a very interesting monthly magazine that glorified some American directors like Hitchcock, Hawks, Walsh, Minnelli, as well as Fritz Lang, Satayit Ray, Bresson, Cocteau, Max Ophuls, or Rossellini. 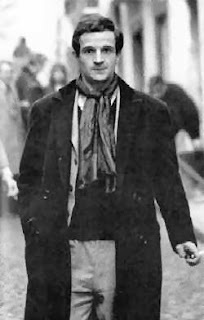 He was highly respected for his very serious intellectual integrity by the other writers and contributors and even though he was the older brother of this group of what was called the ‘’young Turks’’ of French film criticism, did not object when Bazin and Doniol brought François Truffaut on board. Truffaut was a well-known iconoclast who hated the traditional ‘’Cinema Français de Qualité’’. In 1954 Truffaut wrote a famous and very tough article called ‘’ A certain Tendency of French Cinéma’’ that was very polemical and attacked directly many famous French traditional directors who since before WW II were considered the flag bearers of French ‘’studio’’ cinema. It attacked very directly ‘’la tradition de qualité’’ of the post WW II French studio production. In fact that article prefigured the New Wave by denouncing the French Studios traditions, approach to screen writing, and methods of directing, filming, and editing. 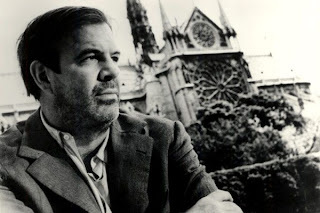 It also was the starting point of a series of reviews and articles by Godard, Rivette, Rohmer, and Chabrol, Truffaut himself, Alexandre Astruc, as well a Jean Douchet, Louis Marcorelles, Luc Moullet, and others, explaining very clearly their critical point of view and why they had a highest idea of the concept of ‘’auteur’’ in films by famous American, and other foreign directors. But major feature articles by André Bazin, who remains perhaps the most important theoretician of the new French cinéma we ever had in France, really had the most impact on the future leaders of the New Wave movement. I went trough my archives yesterday and read, with a certain emotion, the very determinant piece he wrote in April 1957 in the No. 70 of Les Cahiers titled: DE LA POLITIQUE DES AUTEURS (The Concept of Author). This famous piece was in some way summarizing and amplifying many articles written in the early fifties in La Revue du Cinéma and later in Les Cahiers by critics like Jean Douchet, Francois Truffaut, and Chabrol, about Alfred Hitchcock who explained very clearly that for him the story and its script were less important that the precise vision he has of what his film should look like. The No. 39 of Les Cahiers in 1953, a special issue on Hitchcock, is perhaps the most decisive critical piece of work ever written about the genius of that master. But it was perhaps another French critic and film maker, Alexandre Astruc, who became the first to write in a very energetic way about the concept of the film director as a complete artist in charge of an integral mean of expression, an ‘’auteur’’, This very seminal article was published in 1948 in the trade magazine ‘’ L’Ecran Français’’ and was titled ‘’ Naissance d’une Nouvelle Avant-Garde. La caméra stylo’’ (Birth of a new Avant-Garde: The caméra as a Pen). The famous concept of ‘’camera stylo’’ was born. It is too bad that Astruc, (born in 1923, 3 years younger than Rohmer) who before the ‘’young Turks’’ directed some very interesting films such as Le Rideau Cramoisi (1953) Les Mauvaises Rencontres (1955) or the very exciting ‘’ La Proie Pour l’Ombre’’ is quite forgotten nowadays. 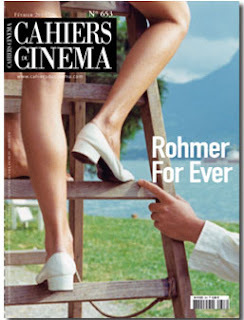 Rohmer became the Editor in Chief of Les Cahiers in 1956 and stayed in that position until 1963, when he was more or less forced out by a group of editors who were closer to the critical theories of Jacques Rivette. How the ‘’ Nouvelle Vague’’ changed the French Cinema? The expression ‘’ Nouvelle Vague’’ was created by Françoise Giroud, a well-known journalist at the weekly L’Express in an article titled ‘’ La Nouvelle Vague arrive’’ in its October 3, 1957 issue. But that term was not specifically applying to the French cinema. It was later on that the French critic Pierre Billard used the same definition to describe the new generation of French film makers. These new directors, helped by adventurous producers, also protested the ‘’star-system’’, that, even in its French form, fossilized the playing style of major French actors. They adamantly opposed the monopoly of the large distribution companies. They tried to liberate themselves from the constraints and regulation imposed by government, trade agencies, and unions, regarding the use of non professional technicians, actors, assistant directors, salaries and wages, numbers of hours, etc. . . . They used improvisation on the set more often, taking a lot of liberties with the pre-written scripts. They adopted new shooting techniques using natural light and new high-speed film. They preferred to shoot in real locations and in the street or in a natural environment rather than in studio. They recorded sound, both from the actors lines and from background noises, on small portable equipment (Nagra), and did not re-recorded or mixed them systematically in the studio unless necessary. They used less complicated and over-orchestrated musical scores and sometimes gave the priority to recorded music, often classical. They used more flexible hand held smaller cameras (like Arriflex or Cameflex), as well as variable focal lenses (zoom), sometimes a little too liberally, decreasing the use of traditional dolly tracking shots and heavy equipment. Make-up became lighter and more realistic. And generally-speaking, they tried, as much as can be, to shoot scenes that looked and sounded as close and truthful as possible to real situations in real environment, and to eliminate ‘’theatrical’’ directions to the actors, who became more free to interact with the director and the other actors and to improvise. All these changes saved time and money, decreasing both the production and casting costs. It is also at this time that the French government started to provide pre-shooting financing assistance to accepted film projects, which would be reimbursed eventually from the money the film would generate in the theaters. These new-wave film-makers revered directors like Dreyer, Eisenstein, Griffith, Renoir, Tati, Vigo, Becker, Bresson, Grémillon, Rosselini, Lang, Hitchcock, Mankiewicz, Von Sternberg, Lubitsch, Bunuel,Welles, Walsh, Wilder, Stroheim, Ophuls, Hawks, Tourneur, or Nicholas Ray, Bergman and Mizoguchi. And later Samuel Fuller, Minelli, and Cassavetes, Antonioni, and Kubrick. But they frankly did not have much respect for French directors such as Carné, Delannoy, Autant-Lara, René Clair, Paul Le Chanois, Gilles Grangier, Henri Verneuil, Denys de la Patellière, Henri Decoin, Georges Lacombe, André Cayatte, or Christian Jacques, Pierre Chenal, and the Allegret brothers. Perhaps a little more for Georges Clouzot and Jacques Feyder. I recently saw Rivette's last film, "36 vues du Pic Saint- Loup", and I was totally amazed by the perfect blend of audacity, modernity, and romanticism displayed by this still young 82 year-old director. 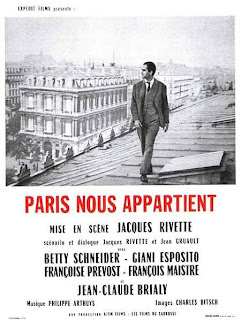 To me, he represents perhaps the most original facet of what the Nouvelle Vague had to offer, and Paris Nous Appartient is really one of my favorite films of that period. I highly recommend the reading of the extremely well-documented and illustrated, and very entertaining book Nouvelle Vague, by ex '' Cahiers'' critic and professor Jean Douchet, published in 1998 and translated in English under the title French New Wave. It is really the ‘’bible’’ of everything you should know about the French New Wave and its influence on world-wide cinema.